The first thing we always tell our customers is that we need to stop the bed bug feeding cycle. If they don't eat, they won't reproduce. With that in mind, our first step is to stop the biting. All our mattress encasements, bed bug covers, box spring covers and pillow covers are CERTIFIED BED BUG PROOF. Our bed bug mattress covers and encasements are used to protect and seal off the mattress and box springs preventing bed bugs from entering or escaping the mattress. 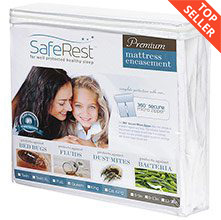 SafeRest premium bed bug mattress covers were specifically designed for full bed bug, fluid and dust mite protection and offer an exclusive patent-pending 360° Secure Micro Zipper. SafeRest encasements have been lab tested and certified bed bug proof by Snell Scientific and are registered as a class 1 medical device with the FDA. SafeRest premium box spring covers were specifically designed for full bed bug, fluid and dust mite protection and offer an exclusive patent-pending 360° Secure Micro Zipper. SafeRest encasements have been lab tested and certified bed bug proof by Snell Scientific and are registered as a class 1 medical device with the FDA. 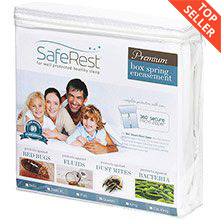 SafeRest premium waterproof zippered pillow protectors are popular for their ability to breathe, operate silently and provide premium protection from dust mites, bed bugs, allergens and fluids. Protecting your child's crib mattress against fluids, invading bed bugs and dust mites requires more than just your average zippered crib mattress encasement. 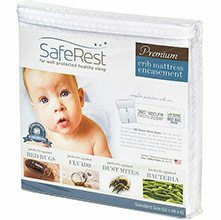 SafeRest crib mattress encasements were specifically Designed from beginning to end for bed bugs, fluid protection and allergy relief. SafeRest is a premium brand of mattress protector products developed through extensive research and cutting edge technology. Each SafeRest mattress protector was designed and engineered specifically to help improve the health of the sleeper while protecting the mattress from fluids, stains, dust mites, bacteria and bed bugs. SafeRest innovative protection features include their Breathable Waterproof Airflow Covers, 360° Secure Micro Zippers and Solid Double Seam Stitching positioning SafeRest as the leader in protection products nationwide. Along with SafeRest's innovative features, every component used in the production of their protectors were hand picked based on strict quality standards. This commitment to quality ensures that each SafeRest protector will perform to the full extent of its 10-year warranty. All SafeRest products are also Vinyl and PVC free. SafeRest Products include Mattress Encasement, Box Spring Encasement and Pillow Encasement. SafeRest's patent pending 360° Secure Feature offers the ultimate in protection against bed bugs by eliminating the risk that the end zipper traveler will pull exposing the mattress to bed bugs. This is realized by securing the end traveler with a fold-over Velcro flap covering it on all sides (360°). The zipper is often the most vulnerable area of an encasement offering bed bugs an easy entry and exit point. 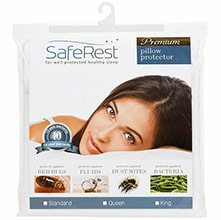 SafeRest's Bed Bug Proof Micro-Zipper Technology is made from rust-proof micro teeth that are so small when closed that not even the smallest stage 1 nymph bed >bug can pass through. The high quality of SafeRest's products reflect the high standards of their manufacturing process. Each SafeRest protector is carefully inspected to ensure each protector conforms to their strict quality standards. To demonstrate their commitment to quality, each SafeRest protector includes a full 10-Year Warranty. The surface material on all of SafeRest's mattress and pillow encasements are made with soft cotton terry, which naturally absorbs moistures making their products completely noiseless. Cotton terry is always the material of choice when producing premium mattress and pillow encasements. To make the cotton terry surface material waterproof, dust mite proof and bed bug proof, SafeRest back coats the cotton terry with a breathable hypoallergenic bed bug proof membrane layer. The surface of SafeRest mattress encasements are designed not to interfere with the current feel of your mattress or pillow. No matter if your mattress or pillow are firm or plush, they will still have the same feel after SafeRest protectors are applied. Medical Device with the FDA. Why do I need to encase my bed? Your mattress and box spring are expensive to replace, and should be expected to last you for years. However, they can be easily damaged by fluid stains, bacteria, bed bugs, and dust mites or other allergens. Box spring, pillow, and mattress covers can protect from all of these things while still providing a comfortable sleeping surface. What is the difference between mattress protectors and mattress encasements? Mattress protectors are easier to take off and wash, and are a little bit less expensive (though neither will cost nearly as much as the price of a replacement mattress). However, mattress protectors are not bed bug proof, since they do not have the fully sealed enclosure. SafeRest's mattress encasements are fully bed bug proof, since the zippered enclosure is sealed on all sides. Will a mattress cover change the feel of my mattress? With many brands, the nylon covering will make your bed stiffer and warmer. However, SafeRest's mattress covers use a cotton terry surface material that is very soft and breathable. You probably won't even notice that it's there. What is the difference between a mattress cover and a box spring cover? Box spring covers use a heavier polyester material for maximum protection. Mattress covers use a breathable top layer made of cotton terry, to ensure that air can flow through your bedding correctly while still protecting from fluids, allergens, and bed bugs. For the sake of comfort and breathability, make sure to check the packaging before installing a cover on your mattress.